Please come, bring a friend. Reading all the articles isn't required, just a willingness to engage in discussion. The readings for this and Social Justice, 2013 E. Genesee St.
session are two chapters from Petra Kelly's Thinking Green! and an essay by ecofeminist writer Maria Mies. 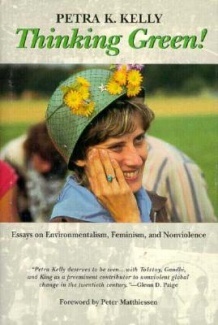 Petra Kelly was a principal founder of the German Green Party, a prominent advocate of nonviolence and women's rights, and a prolific writer who authored Fighting for Hope and Thinking Green: Essays on Environmentalism, Feminism, and Nonviolence. Invite friends by spreading the word on Facebook. Here's the event page! Contact Maureen with questions, mfcurtin13126@yahoo.com.